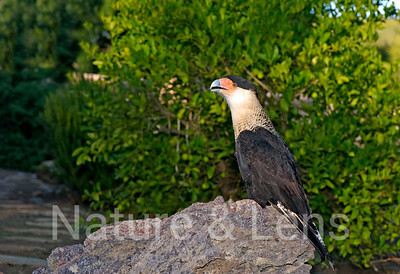 Crested Caracara, Related to the typical falcons, but very different in shape and habits. 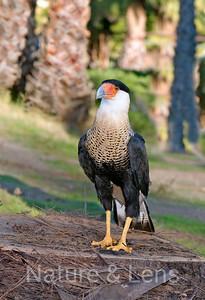 The Crested Caracara is a strikingly patterned, broad-winged opportunist that often feeds on carrion. Aggressive, it may chase vultures away from road kills. Widespread in the American tropics, it enters our area only near the Mexican border and in Florida. 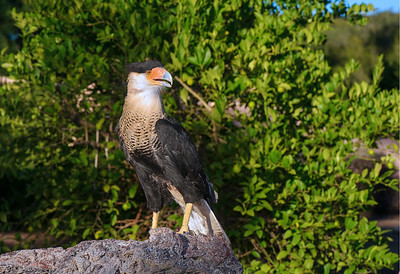 "Caracara" comes from a South American Indian name, based on the bird's call.